Why are medical bills soaring? Blame a 42% hike in hospital prices. 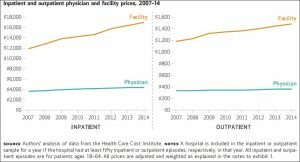 Patients and reformers attacking skyrocketing health care costs may want to focus less on doctors and more on big, shiny hospitals, where in just five years prices soared by 42 percent for inpatient care versus the still sizable 18 percent price hikes that MDs scored. Those findings are part of a new study that examined medical costs based on actual payments, focusing on common procedures like deliveries of babies (vaginal and cesarean), colonoscopies, and knee replacements. 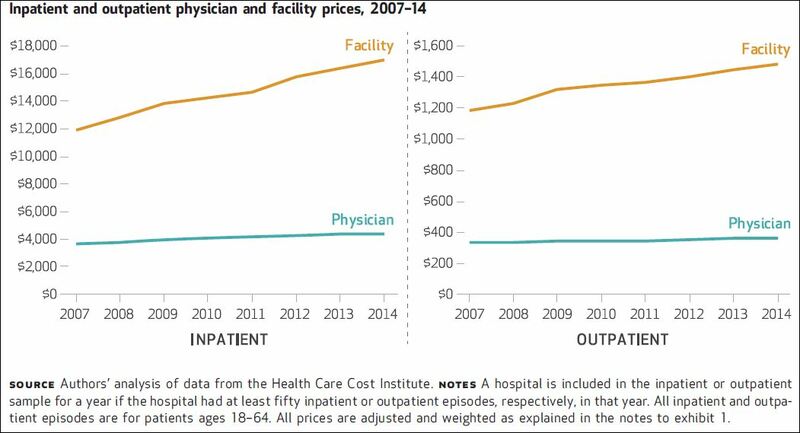 “Hospital prices grew much faster than physician prices for inpatient and outpatient hospital-based care in the period 2007–14 … The same pattern was present for all four of our procedures,” wrote the researchers from Yale, MIT, and Carnegie Mellon. They found that hospital costs also spiked for outpatient care, increasing 25 percent, versus 6 percent for doctors. This meant that for a knee replacement costing $30,000 or so, the doctors’ mean price was almost $4,900, while the hospital price was almost $25,000. For a $13,000 C-section, the doctor’s mean price was $4,600, while the figure for hospitals was $8,300. These numbers were derived from analyzing hundreds of thousands of procedures. While others have found that hospitals jack up prices just because they can — “spit balling them,” rather than basing them on hard data — the authors of this study, published in the journal Health Affairs, reported that “the majority of the growth in the total price of [hospital] care was driven by growth in facility prices.” They don’t dive into these but do note that they ruled out the possibility that hospitals, during the study period, increase the quality or amount of their care. Instead, what the record shows is that hospitals keep building, growing, and expanding — in costly and too often unneeded equipment, services, and facilities, as well as sometimes new enterprises, such as stand-alone urgent and emergency care centers and surgery shops. These initiatives, pushed by guys in suits with business degrees, fatten hospital profits — Americans spent more than $1 trillion in 2017 on hospital care — but don’t necessarily improve matters for patients. Despite evidence questioning the clinical benefit, the use of the robotic platform for surgical procedures is increasing. No benchmark exists for the cost of acquiring and operating robotic systems, and previous cost evaluations have either omitted key expenses, or utilized billing records that do not itemize costs with sufficient granularity. Because one company supplies most robotic technology, and all their revenue comes from system, service, and instrument sales, the minimum cost to hospitals can be estimated by examining the revenue in this company’s financial statements. To put these sums in perspective, researchers noted the total cost of common operations like removing a gallbladder ($3,000) or a pancreas ($7.000) without robotic assistance. If surgeons operate in key-hole fashion, disposable instruments for laparoscopic procedures run about $1,000 of those operations’ cost. In my practice, I see not only the harms that patients suffer while seeking medical services, but also their struggles to access and afford safe, efficient, and excellent medical care. This becomes a daunting challenge as costs head to the skies for treatments and prescription drugs and the complexity and uncertainty also rises about medical options. No one wants to stand in the way of significant medical advances. But with robot surgery, why should already sick or injured patients get gouged for medical services that aren’t demonstrably better for them? They suggest that patients, lawmakers, and regulators consider tough steps to curb cost outrages, including hospital-focused pricing laws and anti-trust actions to ensure institutions don’t engage in anti-competitive dealings and mergers. They say that federal programs like Medicare and Medicaid should arm-twist hospitals using their giant reimbursement power to wring out excesses and to set valuable pricing benchmarks. Hospitals should be prodded to provide more information and transparency about their prices, and doctors should get with the program and be more diligent in where they refer patients and where they practice. The Amish and other Anabaptists, including Mennonites, do not carry commercial health insurance; they prefer to pay for healthcare and other goods and services in cash, and they are famously thrifty shoppers. They wanted one all-inclusive [hospital] price for tests, procedures and episodes of care, rather than a lengthy list of itemized charges that didn’t even include professional fees. So, over the years … administrators, physicians and staff [at Pomerene Memorial Hospital in Millersburg, Ohio] painstakingly costed out dozens of services, from diagnostic tests to elective surgical procedures. Over the last two years, they tackled the hardest type of service for which to calculate input costs—inpatient care. Now the 55-bed hospital, about 60 miles south of Cleveland, offers more than 300 services with guaranteed package prices—including all types of inpatient care episodes—to the Amish and any other self-paying patients. That has drawn Amish and other Anabaptist patients from around the country seeking care. A hospital that puts in the hard work to ensure its patients’ needs, including their financial concerns, are taken fully into account — and the institution thrives because of it goes an extra mile? Now that’s sounding downright divine.